Whether you’re building an app or running an online store, analytics can help you figure out what your users are trying to achieve and how you can serve them better. To that end, Google has launched a new set of enterprise-grade tools to help marketers gain insights about their customers’ journey and habits, and share that knowledge with their teammates. Google Audience Center 360​ is a data management platform that helps marketers understand their customers. It works natively with Google and DoubleClick’s ad networks as well third-party data providers. Google Optimize 360 (beta) lets you test your site with multiple variations of messaging and interface elements to learn what works best with your audience. 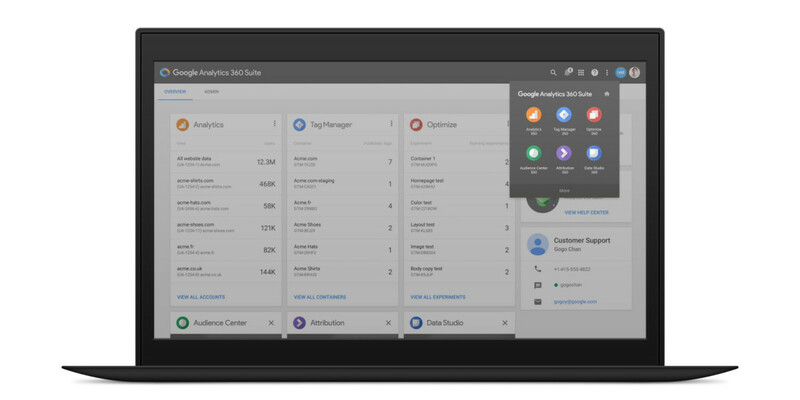 Google Data Studio 360 ​gives you a closer look at your data with visualization and real-time collaboration tools. It can also generate reports and dashboards to help you track stats. Google Tag Manager 360​ allows for simplified data collection using tags across your sites and campaigns, along with support for APIs to streamline your workflow. Google Analytics 360, formerly known as GA Premium,​ is a hub for all your data measurement and ad product management needs. The company says it will add a host of new features in the next couple of months. Google Attribution 360, formerly known as Adometry​, informs advertisers with data to value their marketing investments and allocate budgets precisely. While it’s not entirely new, the app has been rebuilt from the ground up to integrate with the rest of the suite. The four new products are available from today in limited beta​. Google Analytics Premium and Adometry customers will see the products renamed in the coming months, and receive invites to join the new betas soon.